The meteor shower makes its wowza return. ANZA-BORREGO DESERT STATE PARK, or Death Valley National Park, or Joshua Tree National Park, or the Salton Sea, or the scrubby-spectacular destination of your choosing, for December is Geminids meteor shower time. The sky-streaky occurrence isn't all December long, mind you, and the Ursids come along around the winter solstice, so plan out your dates now for Dec. 4 through 16. The biggest night for some "did you see that?!" type sights? You'll want to pitch your tent on Dec. 13 (and look to the Anza-Borrego Foundation, which has great suggestions on how to best enjoy the event from the beautiful Southern California desert). Spying any of the shower, of course, isn't predictable, and there is the thrill of looking in the right direction at the right moment. But being surrounded by cacti, and rocky hills, and ancient ravines, and the occasional coyote howl, feels like the way to set the scene, whatever you might spy in the sky. Need a break from the pre-holidays? 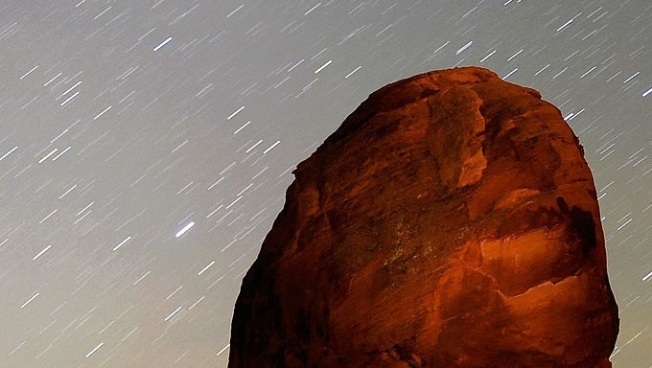 Let the Geminids draw you to the desert, and out of day-to-day doings for a night.